To provide the product’s high demand in the marketplace, corporations should employ different machines to attain faster and easier production. Finding a machine is not difficult as there are lots of assortments searchable in the internet. However, finding the right one would require much attention and considerations. There are numerous factors to consider in selecting filling machine and the most essential factor is determining the viscosity of the liquid. As the viscosity of the liquid changes, the procedure of filling it into its container also changes. There are basically two classifications of liquid, the first one is “less viscous” or the free flowing liquids, the best example is water. The second type is the “highly viscous liquids”, products under this category include ketchup and honey. Gravity fillers and overflow fillers are the two types of equipment that are mostly used in filling less viscous liquids. To give you an idea on how each filling machine works, below is a brief and concise explanation. The name can tell itself as it uses the law of gravity in filling liquids into its container. It normally consists of an over-head tank with a valve. The containers to be filled will be set-up below the valves. After arranging the containers, the valve is now ready for the setting-up of the desired time interval as a requirement to completely fill all the arranged containers. After the filling is done, the supply automatically cuts off. All the filled containers will be then forwarded and replaced by other empty containers. This filling machine is typically consist of a nozzle that fills the container to its desired level regardless of the measurement of the inside volume of the container. Once the liquid reaches to its level, it overflows and the overflowed liquid returns back to the main source of the supply container. This machine is ideally used in filling carbonated drinks and bottled water. For liquids that are highly viscous, the above-mentioned machines are not ideal to use, thus it require other machines to handle the complexity. 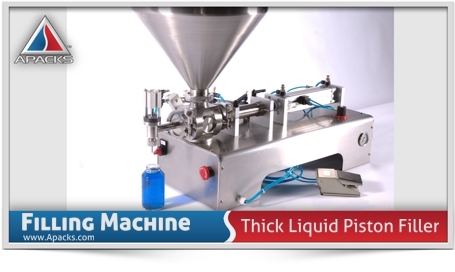 Pump fillers and piston filling machine are the best alternative in handling high viscous liquids. Pump filler is consist of fill heads. Each head has a pump to push the liquid into it. This filler is also time-based that has ON and OFF button for the desired time interval. This mechanism guarantees that the containers will be filled with the same liquid amount. Like pump filler, piston filler is also best in filling highly viscous liquids with excellent accuracy. The typical piston filler is consist of a piston and cylinder. As the piston is pulled out, the cylinder will be filled with the predefined volume of liquids.